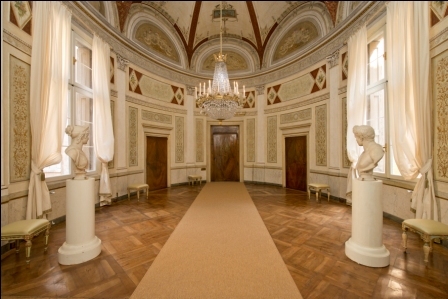 The apartments already decorated twenty years before during the visit of Emperor Ferdinand I were further renovated and enriched with tapestries, floral motifs, stucco, gold. The Empress visited Venice twice:for thirty-eight days, between November 1856 and January 1857, and again for seven months, between October 1861 and May 1862. 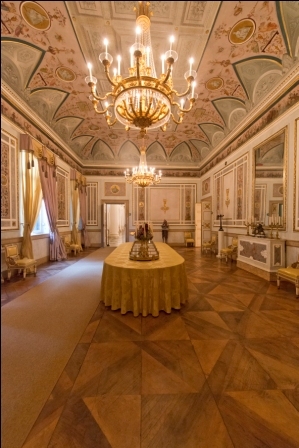 The visit starts from the Weekly Dining Room , decorated in 1836 by Giuseppe Borsato with polychrome frescoes candelabra surrounded by geometric motifs in chiaroscuro. 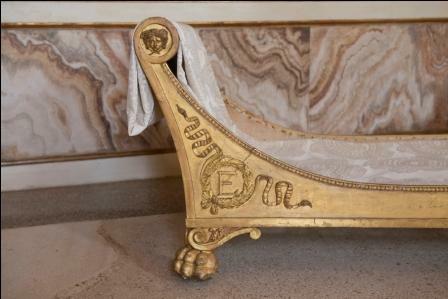 The decoration of the next Throne Room Lombardo-Veneto is dated two years later, 1838. The Room will become Waiting Room for Audiences in the next period. 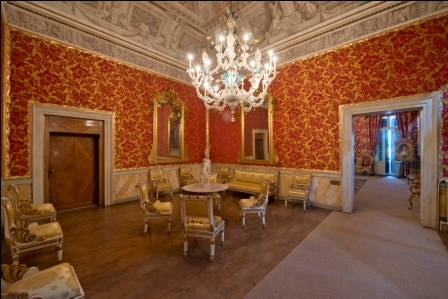 Red and gold tapestry, identical reproduction of the original below, and white and gold empire original furniture gives solemnity to this environment. Centrally a beautiful eighteen century Murano chandelier with multi colored floral motifs. The following Audience Hall hosts a series of ten armchairs upholstered with the original eighteenth century Venetian brocade velvet. Beautiful “Portrait of Empress Elisabeth of Austria,” the mid-nineteenth century. 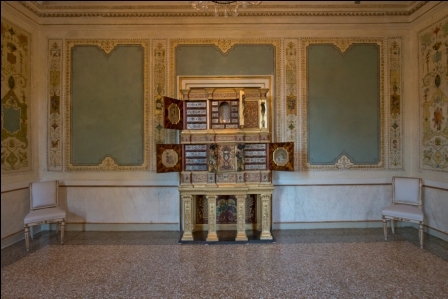 Venetian handicraft work, decorated with painted and gilded mirrors, carvings and lacquer. 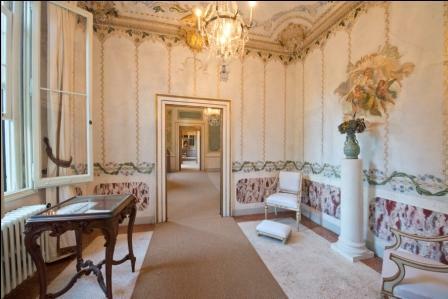 completely redecorated in 1856 with delicate motifs in gold and nacre. The decoration of floral type consists in lilies and fiordaliso, the favorite empress flowers. The master bedroom, with walls covered with blue carpet and gold identical to the original below, contains an important furniture empire, the Eugene Beauharnais bed . Eugene Beauharnais , Napoleon’s stepson, was viceroy of Italy between 1806 and 1814. 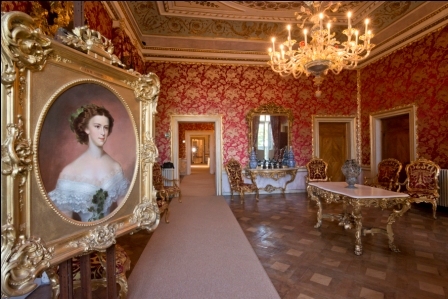 On the walls the portraits of Emperor Franz Joseph and Empress Elisabeth, works of Georg Martin Raab, 1874. I’ve visited in Venice twice and would love to go back again. The imperial rooms look stunning. Such amazing rooms…the decorations, the furniture and the art. That is impressive, almost beyond the imagination! The architecture and decorations are very beautiful. Impressive. And in one of my favourite cities too.